Sanctuary Outreach relies on and values the help of volunteers. Whatever background or experience you have, there are many ways you can get involved! 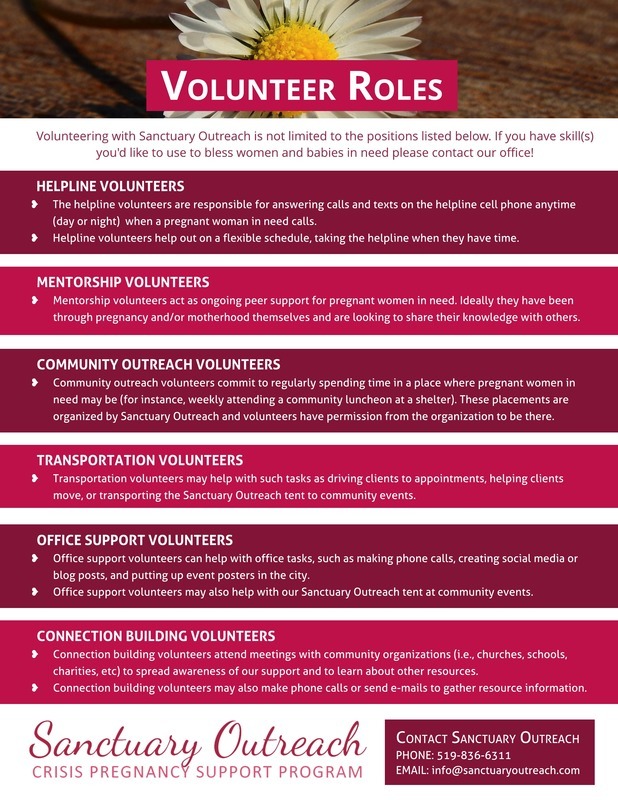 Volunteering as a mentor, taking a shift manning one of our outreach booths, assisting with office tasks, or helping with our 24/7 pregnancy helpline; these are only a few ways you can help to make a difference in our community through Sanctuary Outreach. We are always especially interested in volunteers with a background in nursing, counseling, or related fields. If you would like to be part of our work please contact us for more information about volunteer opportunities. Roles are not limited to those listed - if you have a skill that you want to share, we would love to have you. If you are looking for a shorter-term volunteer opportunity with less commitment, we encourage you to consider hosting a small community BBQ as a fundraiser for our Infant Car Seat Fund (more info here).